168 grain Hornady A-max- BULK (SBR load), WCC once-fired brass, Federal 210 primers. Ammunition is designed around a barrel length of about 11″, but works very well with any shorter length barrel. This ammo can also be used in barrels 16″ to 20″ shooting suppressed to maximize the speed in the shorter barreled rifles. 100 rounds per order!! What is an SBR Load? My “short barrel rifle” (SBR) load is designed to 1) increase velocity in an SBR, 2) have a more complete powder burn, 3) cleaner rifle and magazine. Increase velocity in an SBR- Most standard 308 ammo uses medium to slower burning powders designed to maximizes the speed in 22″-24″ barrels. This slower powder is perfect for those longer barrel applications, but not good for an SBR. 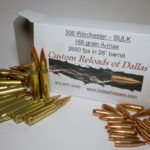 When using this traditional 308 ammo in an SBR, about 8%-15% of this slower burning powder is unburned and not utilized. It is very inefficient and is wasted energy that dirties up a rifle, especially shooting suppressed. More complete powder burn- With a faster burning powder in my SBR ammo, you can get a 99.8% powder burn in 11″ of barrel. 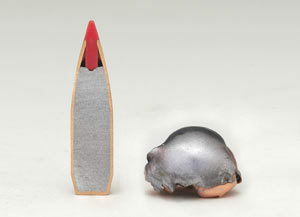 This allows more of the powder’s energy to be utilized in propelling the bullet in the shorter barrels. This also makes the round much more efficient. Cleaner rifle and magazine- When using standard 308 ammo with slower powders, this 8%-15% of unburned powder makes the rifle, suppressor and magazine very dirty and coated with a film of powder residue. With my SBR load, the powder will have a 99.8% burn in 11″ of barrel to greatly reduce the amount of powder fouling and keeping the rifle cleaner. Why 308 SBR ammo? 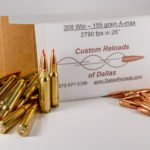 With multiple customer feedback and requests for better ammo designed for SBR rifles, I have created this ammunition specifically designed for SBR rifles chambered in 308 Win. Try it, and you WILL see a difference! Want a different bullet loaded for your SBR? Please contact us!